V10: 7 new guns and counting! Total: 41 brand new killing devices! The SKBP is a huge add-on to Ballistic Weapons, which massively boosts the arsenal available to the player! V++ is the ongoing designation of all future developments of this pack. Release dates are random and unplanned and production may be halted at any given time. V++ will maintain the split packages format of V10 and may or may not require custom BW bases to run properly. I'll update this space with new weapons as they appear. There are three important components to the SKBP. 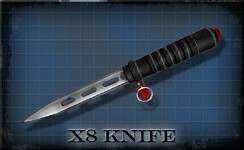 This is the core of the bonus pack, and contains all of the weapons from V6, V8, and V9 in updated forms. Most of the weapons are being upgraded with new models and functionality, and some are receiving major overhauls to fit our new standards of quality. This component is required to run all components. This pack is an expansion pack and contains all the brand new weapons we're shoving into V10. This component is our most ambitious one yet, with a plethora of new models and new designs being thrown into the mix. Those of you who participated in the V9 Prototype public beta will recognize a lot of these guns, as this pack will hold all of the prototypes that passed inspection. Low Definition Texture Download: Fixes AH104 on low-detail settings. Last edited by Ziplock_Jim on Fri Aug 07, 2009 11:28 am, edited 1 time in total. Very impressive work I must say. I am the creator of Carri, Jacki and Kherri, my oc's. I've been playing CoD4 a lot recently, and I noticed how lethal the Last Stand feature is with the Desert Eagle. With a little tweaking of the Dark Star Berserk code, I've implemented a version of it into the AH-104. When the special weapon key is pressed, the player's movement speed is greatly reduced and the weapon fire rate is drastically increased. Like in CoD4, you will be rooted in one spot and can dish out punishment to your potential killer. Once you enter Last Stand mode you cannot leave it, so use it wisely. I don't know weather I should make the Last Standee stronger or weaker. Tell me what you think! I say implement it as a feature that you can use anytime. It doesn't really seem like something that will work in UT, even with the changes Ballistic Weapons brings. Besides, there's already a function that improves weapon function at the cost of mobility. 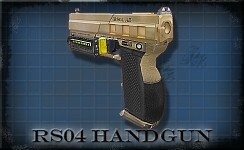 Furthermore, it would only make sense if it was integrated into all weapons, similar to the way COD4 did it. Say, if you get hit with a fatal blow in the limb or something, you fall to the ground and are forced to use your sidearm. One more shot would kill you, or if you manage to take the enemy down, you die anyway within a few seconds. Adding the martyrdom option would be neat, too. It'd make more sense for the feature to be on every weapon, but since the AH-104 had no previous special weapon function and most of the others already have specials, I thought it'd be a nice AH-104 specific addition. Unlike in CoD4, Last Stand can be activated at any time, but only a stupid player would seal their fate and activate it at the start of the match. If you have a grenade out, by the way, it automatically goes Martydom when you die. Last edited by Sgt. Kelly on Wed Jan 30, 2008 6:42 am, edited 1 time in total. how are you going to make sure the autoshotgun is balanced? and whats the difference between a M30A2 and a M30? Shotgun attatch vs. something else? but still, wow, another 8 wep pack in less than a month.. Thanks! Last edited by skyfe on Mon Feb 25, 2008 8:25 pm, edited 1 time in total. If I am not me then who the hell am i? That day i learned a valubal lesson about iron claws , they hurt like hell. The pack is nearing completion - I'm just doing some bug fixing and working on that last weapon. Anyway, I think it's time I released some info on the guns. First up, the Single-Man Anti Tank/ Anti Air Recoilless Rifle, also known as the SM-AT/AA. Background: The Flak 16 SM-AT/AA Recoilless Rifle is a reloadable, single shot rocket launcher. The portable version of the Flak 54 AT/AA system, the Flak 16 SM-AT/AA is housed in a G5 casing and fires high-speed AP shaped charges for maximum penetration and damage. The portable Flak 16 was engineered after UTC generals noticed the Cryons' knack for overrunning and taking over their Flak 54 sites. This new Recoilless Rifle has been the bane of Cryon armored divisions ever since. Last edited by Sgt. Kelly on Sat Jul 19, 2008 9:18 pm, edited 1 time in total. I'd love to know more about the M50 mods you did. I do think that is gonna be awesome to actually have multiple types of the same gun, like the CoD4 way with the 3 or 4 M4's. cmon, post a release date! Shouldn't be too long now. Second up - the M30A2 Tactical Assault Rifle. Background: With a forward mounted laser sight and heavy .42 rifle rounds, the M30A2 Tactical Rifle can accurately snipe targets at almost all distances. In order to compensate for a slower firing speed and heightened recoil, Enravion has decided to add a secondary gauss projectile accelerator to the barrel. By simply depressing the trigger twice in quick succesion, the user can activate the system and propel the bullet at a much higher velocity through the armor and flesh of unsuspecting victims. (With regards to a 2 second recharge time.) The A2 comes equipped with a mounted camera sight for increased accuracy. The M30A2 is Enravion's answer to NDTR Industries' SRS-900 and Black & Wood's R9. Last edited by Sgt. Kelly on Thu Feb 14, 2008 8:55 pm, edited 1 time in total. Um, what's that on the hand in the second pic? Last edited by skyfe on Sun Feb 10, 2008 10:16 am, edited 1 time in total. Absolutely nothing. You're seeing the Heavy Armor in the level. I absolutely love this version of the gun already! Are the "Extra Weapons" special surprises, or just random weapons you felt like throwing in (you were bored one day, or you found it online. The misplaced arm on that gun is an animation problem; the M30 and M30A2 use the default M50 animations. I sadly don't know how to animate, so I've been looking for someone or at least some tutorials. I'm not going to release if like that, so don't worry. Please create the AK74! I like that weapon! WoW I love all your weapons already lol. Is there a way to add melee for the rifle too? BTW What map is it?, the top one of the assault rifle?. Wow these would be so nice! So I donÃƒâ€šÃ‚Â´t know anything about producing mods or whatever so.. oes this thing just replace the BW weapons or are they totaly new? All you have to do is set which weapon group you want them to be with. They work with modes like loadout and arena and everything as well. do I get a cookie if this is right? you'll run through each weapon, every few days, until you showed them all: then release it. thanks for tantalizing us. Though your automatically forgiven for making the pack in the first place. I'm not going to release until everything functons smoothly, though. I want this to be as bug-free as possible. Last edited by Sgt. Kelly on Mon Feb 11, 2008 10:29 pm, edited 1 time in total.